Jack Cork has won a first call-up to the senior England squad after an outstanding start to the season with the Clarets. Cork has been rewarded with a place in Gareth Southgate’s squad for friendlies at Wembley against Brazil and World Cup holders Germany. “I’m really, really happy. I haven’t really got the words for it. I’m looking forward to going to meet up,” the midfielder told the Clarets’ official website. “We’ve had a good start to the season and you’re probably not going to get many better opportunities to be in the England squad, because we are doing so well. Cork, 28, has previously been capped by England at every level from under-16 to under-21 when he was with Chelsea, and also represented Great Britain at the 2012 London Olympics when he was a Southampton player. Cork’s selection comes after a total of six players withdrew from Southgate’s original squad to play Brazil on Friday, 10 November and Germany on Tuesday, 14 November. And he will join up with the England party preparing at St George’s Park on top of his game after a superb start to the campaign. Signing for the Clarets from Swansea City in the summer – following two previous loan spells at Turf Moor – Cork has not missed a minute of Burnley’s Premier League campaign so far. And he has been the model of consistency in the middle of the pitch as Sean Dyche’s side has enjoyed the best start to a top-flight season by a Burnley side since 1973/74. Statistics show Cork has covered more ground this season than any other Premier League player. 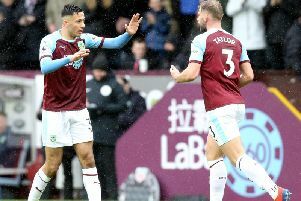 And his shielding of the back four and use of the ball have also been key in helping the Clarets reach the international break in seventh place in the table, with 19 points from 11 games. If he wins a cap during either of the two friendlies, Cork would become the 27th Burnley player to play for England. Cork has, however, had to change his holiday plans after Dyche allowed his senior squad some down-time to re-charge their batteries during the international break. “There are worse decisions in life! I was looking forward to getting a few days with the family after the start to the season and working hard. “But it’s a good reward and I’m just really happy,” he added. Manager Sean Dyche said: “It’s another great marker for Burnley Football Club to have another player called up to a full international squad. Burnley Chairman Mike Garlick added his congratulations, insisting Cork’s call-up following his summer move to Burnley was fully merited. Mr Garlick said: “We are all absolutely delighted for Jack, who deserves this following his super start to the season. “It shows players that coming to Burnley is the place to come. In our culture and environment, players can and do improve and it’s not the first time we have seen this happen.